Other than garbage, a lot has gone into trash cans over the last five years. Manufacturers are trying to outdo each other by trying to come up with the best stainless steel trash cans that meet our needs conveniently. The result is more innovative improvements and advanced designs. One such improvement in the trash can industry is the automatic touchless trash cans. This guide looks at both types; automatic, and manual kitchen stainless steel trash cans so you will have found your ideal can on completing this guide. Simplehuman is a very reputable company that is built on finding new innovations and technologies to streamline daily tasks. As such, our guide contains a couple of high-value Simplehuman kitchen stainless steel trash cans. The one of the best stainless steel trash can by Simplehuman can do exactly that – simplify the daily trash task. It is well designed and of top-notch quality. It comes in a small size, having a mere 2.3 gallon-capacity, making it ideal for small spaces like under the desk or in a bathroom among others. This automatic stainless steel trash bin has a semi-circular design that makes it ideal for use on corners. 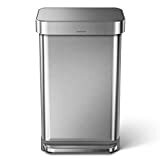 Similar to other Simplehuman trash cans, the CW1833 is very durable and has a strong pedal that allows more than 150000 uses before needing replacement. Additionally, it has a removable inner bucket that makes for simpler disposal. This CW1833 model features the patented lid Shox technology. The lid, in other trash can models, slams shut. For the CW1833, the Shox technology closes the lid slowly and silently, making almost completely no noise. Its compact size and lightweight (5.3 lbs.) do not make it dog proof. However, it preventing cats and puppies will be a very easy job. This product seems to satisfy a lot of users and I could not find any downside to it apart from its compact size. What sets this unit apart from the rest is its center-split opening feature for clarity. When you step on the pedal, instead of the conventional lid opening found in all other units in this guide, the lid opens at the center, giving it an almost futuristic, cool design. This design, even though not entirely its function, is convenient as it thwarts dogs from opening it. The CW1897 has polished stainless steel construction and a high-quality pedal that is rated for over 150000 uses to allow it to withstand the roughest of treatments. Additionally, it has a space-saving shape, making use of the tightest of spaces. Other features include the non-skid base, and the lid remains open for as long as you need it to be. For the reasons discussed, the CW2024 stainless steel trash can spark a lot of 5-star ratings from satisfied consumers, with more than 90 percent of reviews being positive. The only downside associated with this unit is its price. But since almost everyone is satisfied with its functionality, so will you. Like all Simplehuman stainless steel trash cans, the CW2024 attempts to deliver the highest value for its price. If you do not mind dishing out a little extra cash for added features and functionality, this product will take your breath away from the moment you set your eyes on it. It has a sleek, stainless steel build to fit most décor. Aside from enhancing the features and functions that can be found in other trash cans, the CW2024 brings more that make it worth every outrageous penny. Some of them include the Shox technology that slowly and silently closes the lid and the liner bag ant the back to simplify operation. Although the unit has a registered capacity of 12 gallons, the space it offers is somewhat more than what other 13 and 15-gallon unit offer. The amount of volume that you get with this unit is ridiculous, as it uses the entire space in the trash bags. With the CW2024, you will cut down on the number of times you take out the trash by at least a half. On the downside, the unit is quite pricey for a trash can. But couple the price with its features and functionality, this might even be a bargain. At a capacity of 13 gallons, this is the best kitchen stainless steel trash can if you don’t want to empty the can from time to time. The TC-1350R by BestOffice has a unique fingerprint resistant construction, made of a highly polished stainless steel frame. Apart from looking good in your kitchen, this frame is responsible for the high odor-concealing capabilities of the TC-1350R. The competency of the infrared technology on the TC-1350R ensures that the lid opens only when you want it to. Just hold your trash or put your hand six inches away from the sensor and it opens. Additionally, it has a manual open and close feature for when you want the lid to remain open until you are done disposing of the trash. 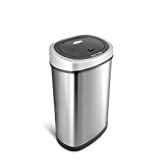 These stainless steel trash cans are ideal for any room be it kitchen, bedroom, living room, or office. On the downside, this packaged unit doesn’t include the power adapter so if you do not want to use batteries, you will have to purchase one on your own. The unit also doesn’t come with a warranty, so if it fails or malfunctions, you will have to pay for professional repair services. If you don’t mind going manual and are looking for a relatively cheap way to dispose of your trash, the CW1950 Step Trash Can is the item for you. This Simplehuman product, aside from enhancing some of the above-mentioned, brings a couple of features that make it a quite interesting trash can. To begin with, the trash can is conveniently shaped to be placed against the wall, completely out of the way. It is has a high-quality, polished stainless steel surface that accounts for its sleek look and durability. It can hold odors well and is safe to use on floors. Second, the CW1950 features the patented Shox technology. This technology closes the lid slowly and quietly, so you won’t have to use your hands if you want to minimize the bang. Thirdly, it has a latch that allows you to lock the lid in the open position and remains in the same position for as long as you need it to be. The steel foot pedal can withstand over 150,000 steps which is much more than you will ever need in a lifetime. It simplifies the opening and closing of the lid. 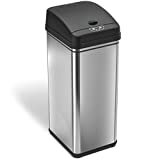 The DZT-50-6 is an automatic trash can from the very reputable company, Ninestars. It is a company that specializes in stainless steel trash cans and their accessories and has had success in over thirty countries in the world. With the DZT-50-6, Ninestars decided to forego the conventional rectangle-circular design seen in most models and go for an oval design to save on space. This shape allows it to fit in virtually every area be it kitchen, laundry room, dorm, bedroom or any open space. Ninestars is famous for its advanced sensor that is found in all their trash cans including the DZT-50-6. The sensor opens the lid automatically when your hand or trash is within ten inches, at a 130-degree angle from it. If you remain within that vicinity, the lid remains open and closes three seconds after you move away. The unit runs on 4 D-size batteries for up to six months with normal everyday use. as is the problem with most touch-free motion sensor stainless steel trash cans, without proper care, the lid malfunctions. The manual controls on the DZT-50-6 come in handy when this happens. I bet you exclaimed “Another one! ?” the moment you saw one more Simplehuman trash can on this review. One word for you – quality. Simplehuman trash cans offer the best combination of price and value so don’t be surprised if you come across one more. 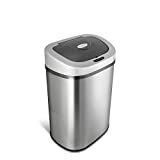 The Simplehuman Mini Round Step Trash Can is only best for you if you are looking for a small trash can that can fit into a small space. Its small size allows it to be placed in the bathroom, under the desk, and many other constricted spaces. 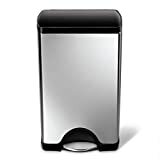 This mini step trash can has a fingerprint-proof stainless steel construction on both its body and its pedal. Yes, you heard me right, pedal, so this will only suit you best if you have no problem with going manual. The convenience of the trash can is heightened by the featured inner liner. This unit has an inner liner that aside from catching leaks, it lets you take out the trash easily. With the small, compact size, Simplehuman had to forego the overall weight of the unit. In doing that, they made a trash can that, if you are not careful, tips over every time you step on the pedal. A weighted bottom would really serve the unit well. The NINESTARS DZT-80-4 combines state of the art technology with a sturdy looking, durable design. It is constructed of the T430 fingerprint resistant stainless steel making it quite durable apart from adding some glow to your kitchen. The sealing technology featured keeps away odor, eliminating the need for fragranced trash bags. The NINESTARS DZT-80-4 features the latest infrared motion technology that doesn’t respond to an accidental gesture. When you want to put trash in the can, you can activate it by waving your hand directly above the can and it opens, then closes when you move away from it. Your hand will have to be ten inches or less from the sensor for it to work. The unit operates on 4D batteries, and thanks to its energy-saving technology, they can be used to open and close the lid at least 10000 times without needing to be replaced. While everything seems right about this product, there have been some problems associated with its lid. Some Amazon reviewers say that after using it, for some time, they start experiencing some problems with its lid. It either opens halfway or fails to open at all. 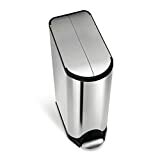 From the very first sight, you will love this sleek looking, anti-fingerprint, stainless steel oval trash can. It has a quality plastic and metal construction that provides protection from water and rust damage, as well as extend its durability. The DZT-50-9 solved a problem common in most auto-opening stainless steel trash cans. The infrared technology in these other models opens the trash when one comes close to it, at times doing it by accident. In this unit, the sensor is located at the top of the lid and doesn’t open unless there is motion directly above it. With just a wave of your hand at a maximum distance of ten inches, the lid opens automatically. The lid fits firmly and the inner bucket holds the trash bag in place, keeping the odors inside. The unit runs on 3C batteries and thanks to its energy saving technology, you will need to open and close it at least 10000 before needing to replace them. With the DZT-50-9, you are assured of a clean looking and clean smelling kitchen. Smelly garbage doesn’t stand a chance with the enhanced iTouchless Automatic Trash Can. 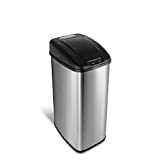 This best stainless steel trash can comes equipped with the latest infrared sensor technology that opens the lid automatically when you approach it within six inches and closes when you move away. It has an extra wide opening measuring 12.5” diagonally, which accommodates bulky and large items. The automatic lid closing system is nothing compared to the odor filter function. The unit comes pre-installed with a carbon filter gate (CFG) that has a 3D surface area, maximizing the odor-filtering capabilities. The deodorizer can be used for up to three months without needing replacement. It is completely environmentally friendly and safe to use around pets and children. With the iTouchless 13 Gallon Trash Can, you can have a safe and clean environment without needing harmful, perfumed trash bags and sprays. 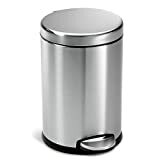 When selecting your best stainless steel trash can, be sure to take into account the overall design, size and all other features necessary to meet your needs. Don’t go for something that will constantly require you to call for customer care services. All the best as you maintain a litter-free environment!